Hosted by Tim Hanrahan and former pro surfer Dayyan Neve. Thinking about a Maldives surf trip? Of course, deciding on which region, whether that be North Male, the Central or Southern Atolls is key. One of our experienced, professional, surf experience specialists will discuss best times, the variety of waves you will encounter and your most suitable accommodation options -call us or ENQUIRE ONLINE. The next most critical decision is without doubt, what surfboard or surfboards should you take on your Maldives surf trip, so ensure you view all the super informative videos below to assist you in your decision making. If you are in Sydney, pop in and say G’day at our good friend Timmy’s epic surfboard store – Aloha Manly Style, he will offer you 10% OFF all new product if you mention The Perfect Wave. In this guide, we’ve put together a quiver of boards perfect for this season’s swell in the Maldives. Picking the right boards to take on your Maldives surf trip can be tricky, especially if you’re a first-timer. You don’t want to pack too little or too many (destination dependent), so we’ve put together a selection from Australia’s best Maldives-specific shapes for you to have a look at based on wave height, type and the quality locations they suit. Designed with help of John John Florence. This board is designed for when the waves aren’t powerful. It is flatter, with less rocker and a single concave right the way through the length of the board and a tail flick. The single concave will allow for speed and drive. Taken over from the fader, a bit wider. It’s a great step-up board and very versatile. It’s a thicker, wider board for a slightly bigger build and bigger waves. This board has great paddle power with extra width at the front and has an extra 6-ounce glass on the top and carbon on the bottom for extra strength. Shorter, fatter and wider but capable of holding in bigger waves. LTF and EPS Foam the same as Firewire. Sometimes the Sci-Fi is so wide in the tail, it’s too fast so it looses control on powerful waves. This board has had the tail brought in to have increased control. Stu Kennedy has been riding it. If you’ve ridden the Sci-Fi and loved it, you’ll love this one too. EPS board with core reactor blank that gives a great flex pattern and the stringers follow the rails. It’s designed to be ridden as a twin fin. The fins are set up further back than normal. It’s a light, fast board. This is a funky bat-tail and side-cuts with flies. Ride when it’s too small for your regular shortboard and want to put something different into your surfing. This is a modern, new school board with channels through the tail. It’s a straight up twin fin with no trailer plug. It’s going to be a fast, loose, responsive board. It has a big, deep swallow tail for hold and control as well as big channels. Would be great for a long running point break. One man we know that has the power to remind us all of the way every surfer should view life is Bob McTavish. Come join us, surf, hang out and talk story with a surfing original, surfer-shaper Bob McTavish. 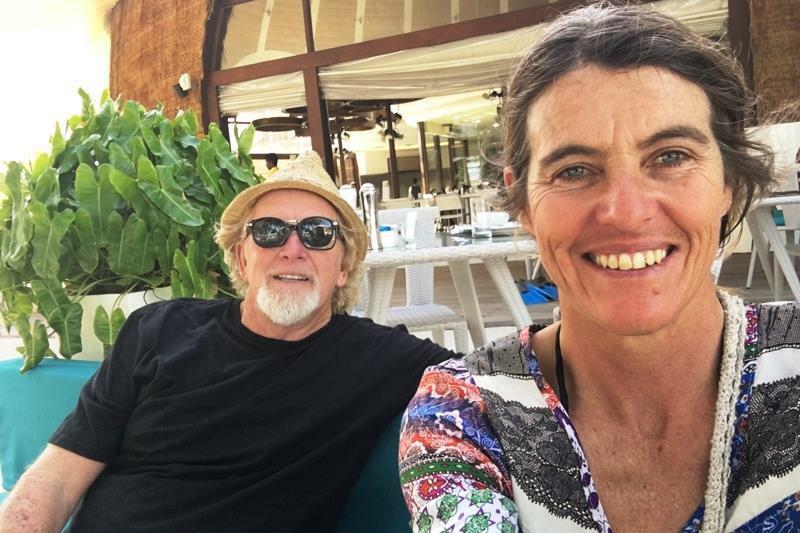 This is your chance to surf with the 1988 ASP World Surf Champion Barton Lynch as you cruise between the Central and Male Atolls on board the spacious MV Naera. Pam is the original, the pioneer, the trailblazer, the Crystal Cylinders pin up girl and of course the 1990 World Champion.